New Prague is a city in Le Sueur and Scott counties in the U.S. state of Minnesota. 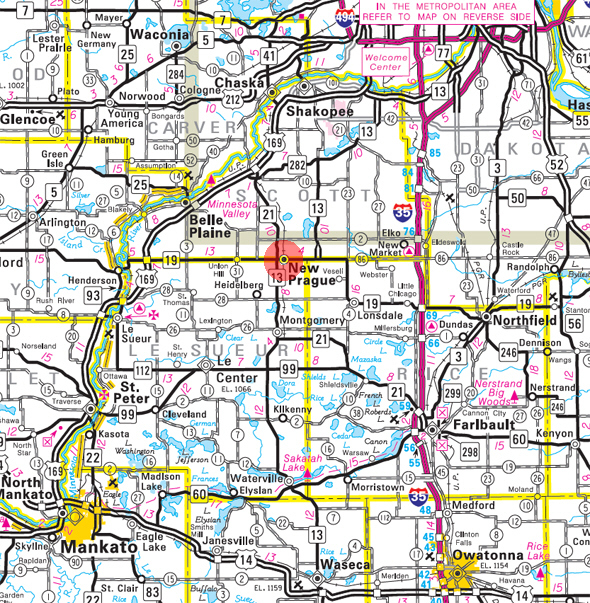 Minnesota State Highways 13, 19, and 21 are three of the main routes in the community. 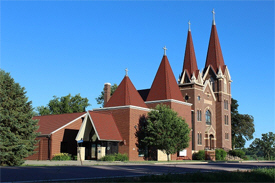 The city of New Prague is located in two counties, Scott and Le Sueur. 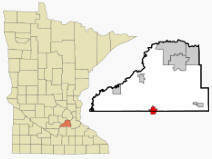 North of Main Street (Highway 13/19) is Scott County; and on the south side is Le Sueur County. According to the United States Census Bureau, the city has a total area of 3.81 square miles (9.87 km2), all of it land. The elevation is 988 ft (301 m) above sea level. As of the census of 2010, there were 7,321 people, 2,711 households, and 1,910 families residing in the city. The population density was 1,921.5 inhabitants per square mile (741.9/km2). There were 2,862 housing units at an average density of 751.2 per square mile (290.0/km2). The racial makeup of the city was 96.5% White, 0.5% African American, 0.3% Native American, 0.6% Asian, 0.6% from other races, and 1.5% from two or more races. Hispanic or Latino of any race were 1.9% of the population. There were 2,711 households of which 42.5% had children under the age of 18 living with them, 55.7% were married couples living together, 9.7% had a female householder with no husband present, 5.0% had a male householder with no wife present, and 29.5% were non-families. 24.6% of all households were made up of individuals and 11.7% had someone living alone who was 65 years of age or older. The average household size was 2.67 and the average family size was 3.22. The median age in the city was 32.7 years. 31.5% of residents were under the age of 18; 6.6% were between the ages of 18 and 24; 29.1% were from 25 to 44; 20.4% were from 45 to 64; and 12.4% were 65 years of age or older. The gender makeup of the city was 48.1% male and 51.9% female. 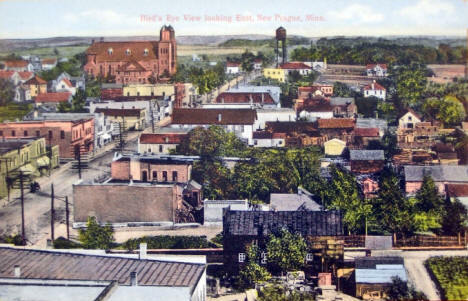 New Prague was laid out in 1856, and named after Prague, the capital of Bohemia (now the Czech Republic). New Prague was originally built up chiefly by Czechs. At the advice of Catholic Bishop Rev. Joseph Cretin, Anton Philipp, a native German, first settled within the present limits of New Prague. 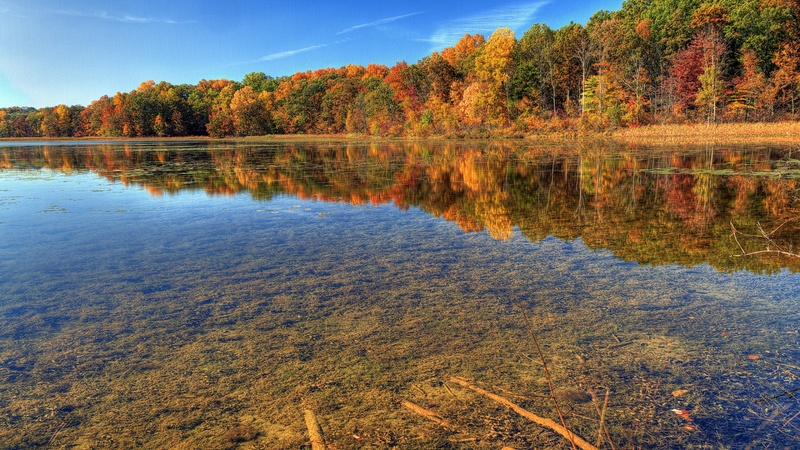 In 1856 Philipp purchased 160 acres in Helena Township, Scott County. Philipp did not make an official plat of the town but began selling lots that same year, marking the beginning of New Prague. Several Bohemian families came to the area shortly after Philipp arrived. New Prague’s early development was not spectacular for a variety of reasons. First, during the Civil War years, 1861-1865, European immigration almost stopped as European immigrants were naturally wary of the U.S. Civil War. Second, located in the middle of the Big Woods, the enormous challenge of clearing fields proceeded at a slow pace. The town was known as Praha from 1872 to 1879. 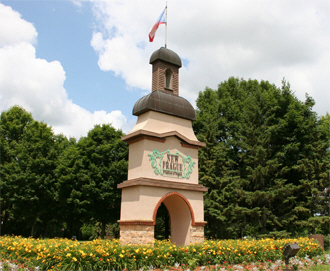 On March 1, 1877, state of Minnesota approved the incorporation of Praha as a village. In 1879 the name was changed to Prague. Czech immigration to the United States reached its peak during the 1880s with 62,000 coming to the U. S. during this decade. Along with Montgomery, which is approximately eight miles south of New Prague, New Prague was becoming the center of “The Bohemian Triangle” of Minnesota covering parts of Scott, Le Sueur and Rice counties, which are neighboring counties. Through the decades since 1856, Le Sueur County has had more Bohemians than any other county in the state. Construction was booming in the 1880s. The town’s first bank opened in 1883, the Czech-Slovak Protective Society (C. S. P. S.) Opera Hall was built, the New Prague Foundry started business, the second public school was built, and two hotels were constructed. The village’s name was changed from Prague to New Prague on February 25, 1884. The 1890s were probably New Prague’s heyday decade. The town was becoming a major market for farm produce and was providing goods and services for growing numbers of farmers and villagers for miles around. Streets were being graded and wooden sidewalks built along the streets. 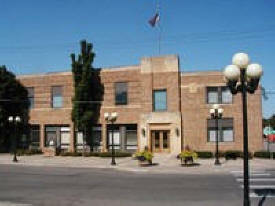 New Prague was incorporated as a city on April 4, 1891. New Prague Flouring Milling Company completed its mill in 1895. Electric lights were installed in the city in 1895, and telephone lines were installed in 1898. Similar to the rest of the state, the 1880s and 1890s were two decades with the greatest growth in population. New Prague’s population more than tripled during that 20-year period going from 384 residents to 1228, while the state’s population more than doubled during that same period. Original businesses outgrew their original log and wood-frame storefronts. A large commercial district filled with solid brick, stone, and wood-frame commercial structures developed along Main Street. NEW PRAGUE, incorporated as a village in March 1877, and as a city in April 1891, is crossed along its main street by the line of Le Sueur and Scott Counties. It was named for the ancient city of Prague, the capital of Bohemia, from which many immigrants came here. The community was first settled in 1854; the Minneapolis and St. Louis Railroad came in 1877; its post office was named Oral, 1857-72, when the community was part of Scott County only, changed to Praha, 1872-79, and Prague, 1879-84, at which time the name was permanently changed to the present one. The New Prague Business Directory is Coming Soon!